Moves a specified number of elements of a specific bit depth from a source address space and offset to a destination address space and offset. The width of the source data. 8-bit 1 The source width is 8 bits long. 16-bit 2 The source width is 16 bits long. 32-bit 4 The source width is 32 bits long. 64-bit 8 The source width is 64 bits long. Address space of the data to be moved. The offset, in bytes, of the device to read from. This terminal is the offset address relative to the device's allocated address base for the corresponding specified address space. 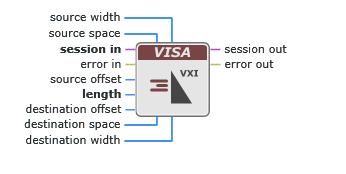 For example, if source space specifies VXI/VME A16, source offset specifies the offset from the logical address base address of the VXI device specified. If source space specifies VXI/VME A24, A32, or A64, source offset specifies the offset from the base address of the VXI device's memory space allocated by the VXI Resource Manager within VXI A24 or A32. Number of elements to move. The offset, in bytes, of the destination device. Address space of the destination. PXI Memory Allocation 9 Physical, locally allocated address space. PXI BAR0 - PXI BAR5 11-16 PXI memory or I/O address spaces 0 through 5. Width of the destination data. 8-bit 1 The destination data is 8 bits wide. 16-bit 2 The destination data is 16 bits wide. 32-bit 4 The destination data is 32 bits wide. 64-bit 8 The destination data is 64 bits wide.